There is something so wild about Ndutu Safari Lodge. Located in the heart of the ancient Ngorongoro Conservation Area and a stone’s throw away from Lake Ndutu, this rustic accommodation allows for safari goers to get right into the soul of Tanzania’s world famous Serengeti park. Every year, millions of wildebeest, along with zebra and other plains game traverse Tanzania in search of green pastures. This migratory journey is one of the most documented and fascinating displays of nature on the planet. Ndutu Safari Lodge is at the epicentre of this journey and for decades has brought travellers from far and wide to this untamed retreat. In keeping with the concept of low-impact tourism and minimal human footprints, Ndutu Safari Lodge is hidden unpretentiously among thorny acacia trees and the brushing grasslands of the Serengeti. These stone and thatch en-suite cottages (34 in total) blend rustic charm with modern amenities, simple homestyle food and adventurous activities. With wraparound views of the swamps, soda lakes and shimmering Lake Ndutu north of the camp, this multi-faceted lodge is a wildlife mecca. Ndutu is about a return to nature, to our roots and primal instincts. Established in the 60’s, Ndutu has transformed from a simple hunter’s retreat to an exemplary example of responsible travel and conscious tourism. Remote and intimate, Ndutu has fallen back on rudimentary ways of gathering water (which is scarce during the dry season), wood (sourcing firewood at the lodge is strictly prohibited) and food (ingredients must be brought in from almost three hours away in Arusha). The emphasis here is on minimalist living and simplicity. Maintaining standards of service and quality requires plenty of hard work from the staff. Ndutu is a close-knit community and the family-like atmosphere makes this a wonderful way to experience the generosity and hospitality of Tanzania. It is not uncommon for the camp to be invaded by curious wildebeest and elephants and the occasional apex predator. Ndutu is unfenced, allowing for the natural movement of animals in the surrounds. Wildlife are free to come and go at will, just another way that Ndutu has maintained an authentic safari experience. Teeming with wildlife, Ndutu is home to plenty of cheetah, lion, leopard, African wild dog, hyena, genet, bat-eared fox and predatory birds. The sheer number of predators is understandable as there could be a meal at every turn for these carnivores. Stalking prey is the order of the day and Ndutu allows you unprecedented access to this natural circle of life. Ndutu Safari Lodge experiences three seasons each year, each dependent on the life-giving rains that fall in the region. Rainfall marks the start of the Great Migration. The usually golden plains are transformed into a lush paradise from November to March. The plains come alive during the calving season and wildflowers dot the landscape in a beautiful spectacle of nature. The dry season from June to October means great game viewing. The green vegetation recedes and visibility increases for high-action predator vs prey interaction. This is a prime time of year to see dramatic wildlife scenes. Ndutu sees guests return multiple times to experience the allure of the last truly wild African savannah. The game rangers and staff at Ndutu Safari Lodge are committed to bringing the Great Migration to the rest of the world. 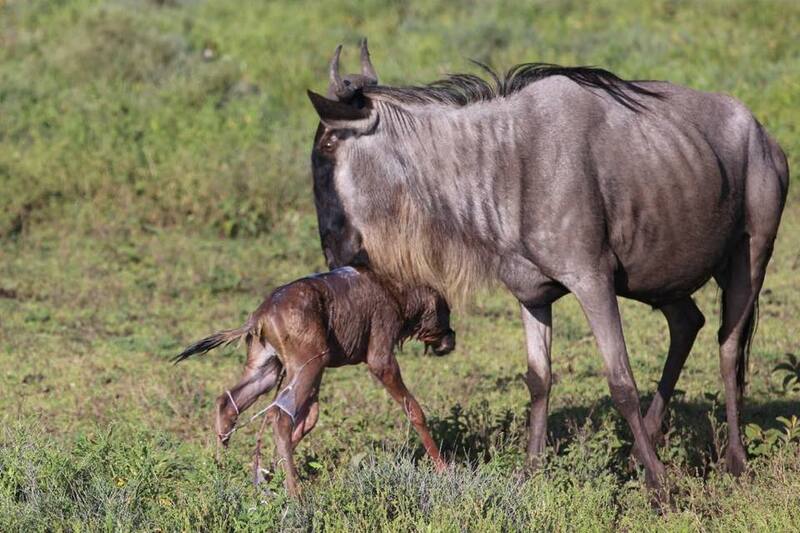 They have partnered with Discover Africa’s migration app called Herdtracker, which provides detailed updates on the wildebeests’ movements through the region. Without Ndutu Safari Lodge and their incredible staff, planning your Great Migration safari itinerary would be impossible. We’d love to extend our thanks to the rangers and guides who combine their experience and knowledge into this project.